“The moment you think you know all about wine, you’re kidding yourself.” This quote from Geoff Merrill, a man who has decades of experience behind him, summarises his approach to winemaking. 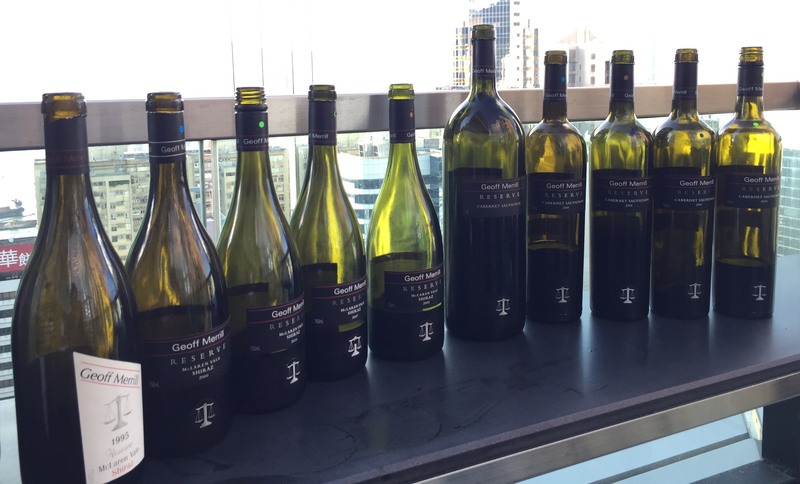 A brilliantly sunny day in Hong Kong and an invitation from Wine’N’Things found a group of us tasting through back vintages from Geoff Merrill Wines with the man himself at the helm, and what an entertaining character he is! His no frills approach to talking about wine is highly engaging and the perfect way to communicate his unwavering belief in the quality of his wines, backed by a depth of knowledge and experience in the industry both in Australia and abroad. Referring to the moment that guided him stylistically in the production of his own Cabernet Sauvignon, Geoff tells us of an informal tasting amongst winemakers where he tasted the 1962, 1963 and 1964 Reynella Cabernet Sauvignons which, we are told, were all excellent wines. However, it was the 1963 that had a “distinct difference” and after a bit of investigation it turned out that the winemaker, Colin Haselgrove, had swapped some Cabernet Sauvignon grapes with his brother, Ron (Harry Ronald Haselgrove) who was the winemaker at Mildara in Coonawarra. The grapes in question came from the famous Peppermint Pattie of 1963 and were included in the 1963 Reynella Cabernet Sauvignon. The combination of mint and herbaceous characters from the Coonawarra fruit with the chocolate and rich fruit flavour from McLaren Vale would remain in Geoff’s mind until it came time for making his own Cabernet Sauvignon. The first release of the Geoff Merrill Cabernet Sauvignon was in 1980 with a 60/40 blend of Coonawarra and McLaren Vale fruit, and the next release in 1982 saw the Coonawarra fruit portion increased to 70%. Vintage conditions determine the final portions each year with fruit undergoing rigorous selection for inclusion in this label. After a year in barrel the premium wines undergo the “three tick programme” which involves Geoff and two additional winemakers individually assessing every barrel. If of suitable quality for the Reserve or Henley labels the barrel receives a tick. If each winemaker gives the barrel a tick, such that there are three ticks in total, the wine is included in the blend, two ticks and the assessment is revisited, one tick and the wine is declassified. In the history of the company there has only ever been one instance of a one-tick wine being included in the blend and that produced a lively debate! The Reserve Cabernet Sauvignon is aged for approximately 30 months mostly in American oak for the cedar and cigar box characters it imparts to the wine. The point of different with the Reserve and Henley wines is the length of time the wines are held back before release. 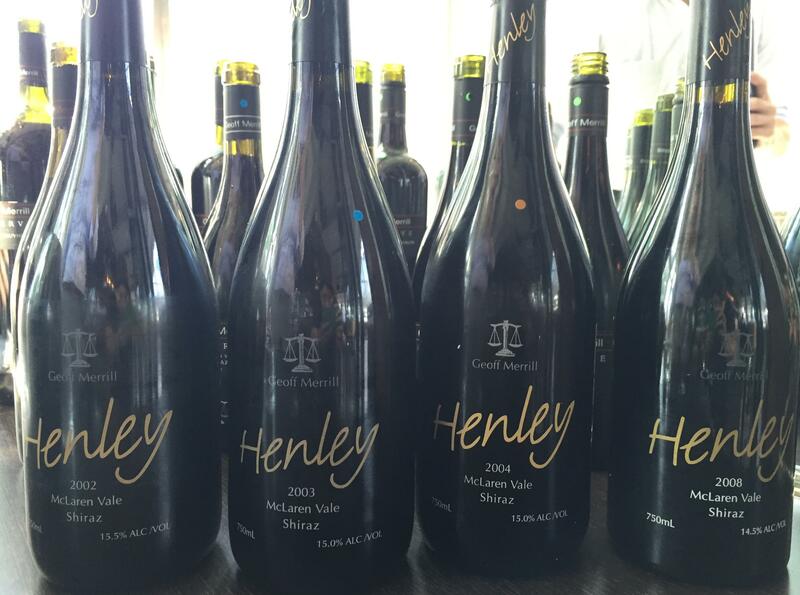 For Reserve wines they are held for a minimum of 7 years and for the Henley Shiraz, a minimum of 10 years. This is particularly unusual for Australia where consumers more commonly drink younger wines and the tax office celebrates whenever it discovers this type of stock, which is taxable each year it remains with the winemaker. As a result the palate in Australia has come to be shaped in part by winemakers’ need to release wines early in a bid to lower tax bills and manage business finances. This places the responsibility of cellaring the wine on the consumer or restaurant, where space is often too expensive for such a task. Thus, finding a producer who has such a strong conviction that the wines shouldn’t be released until they are ready for drinking is a real treat. Both Shiraz ranges were excellent with the 2004 Henley Shiraz being the wine of the afternoon for most around the table, myself included. When I look back on my notes I see countless additions to descriptors I wrote as the wine continued to open in the glass. A depth of complexity was revealed that when combined with a silky mouthfeel resulted in my not spitting this wine out! While I enjoyed the Shiraz, the Cabernet Sauvignon is the wine I continue to think about a couple of days later. Each one had intense flavour concentration and structural elegance. While they packed a (sophisticated) punch they didn’t slap you in the face with their fruit forward style which is what many people expect with wines from South Australia. As it turns out it was my lucky day as I was offered the remainder of the 2005 Reserve Cabernet Sauvignon, which I took home and enjoyed that evening. Lifted herbaceous and floral aromas, particularly violets, red and black fruits, pepper and cigar box were wrapped in a velvety texture and a deliciously long finish. As a dedicated Pinot Noir drinker this Cabernet Sauvignon has coaxed me into revisiting that decision and I expect to see a few more bottles creeping into our wine fridge as the weather cools down!